Has the cooler weather got you wanting to snuggle down? Not yet! Bring your family and friends and have some fun at the Friday Family Dance, October 19 at 6:30pm at Festival Hall, 4214 58th Street, Red Deer. This dance’s feature community partner, The Red Deer Native Friendship Society, has booked The Tradesmen as the live band for this event. This Alberta band plays a fusion of outlaw, prime and top 40 country, blended with classic rock n’ roll. They are certified technicians in their respected crafts ranging from plumbing and trucking to social work. Trent Agecoutay, Jason Berg and Nathan Cunningham are no strangers to a day’s work or a night’s fiesta. Trained by Alberta music legends and seasoned with plain old passion and instincts, their music is a reflection of their roots. Individually they have garnered multiple awards and nominations, including Agecoutay’s current nomination as Best Male Artist in the 2018 Native American Music Awards. This team prides themselves on being a voice for the voiceless, advocates for the working class and just some good ole’ boys having fun on stage-anywhere. With a new single on its way to making a radio debut- “The Journey” of The Tradesmen has just begun. They invite you to be a part of it. Another exciting feature of the October 19 event will be a Métis jig performance, and a chance to try the jig yourself. The Red Deer Native Friendship Society Youth Group will be selling bannock to raise funds for their ongoing programs, and other refreshments will be available for purchase in support of the Red Deer Cultural Heritage Society. 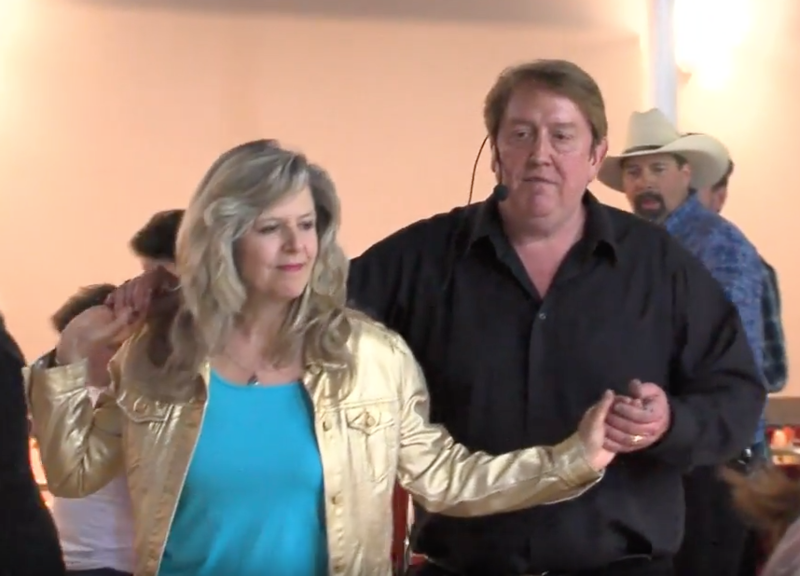 Country Pride Dance Club instructors will be on hand to teach some line dances and review old-time steps learned at Friday Family dances over the last five years. So both newcomers and regulars will have a chance to learn some new moves. DJ Lifestyle Audio will round out the night with a wide variety of contemporary, country and rock and roll music. There will be snacks and doors prizes, including a special prize draw for those buying their tickets online. Doors open at 6:15pm with the DJ starting at 6:30pm and the live band at 7:00pm. Tickets for the October 19 dance are available at the door, or online at www.countrypridedanceclub.ca/familydance; $20/family/household of four; $10/adult; $5/youth; 3 years and under free. Country Pride Dance Club, Red Deer Arts Council, Red Deer Cultural Heritage Society, City of Red Deer Culture Services and the Red Deer Native Friendship Society, with support from Nossack Food Group, are pleased to present Friday Family Dances several times a year. For more information please see this video from one of events back in 2015. Kick it to the Curb this weekend! It’s a fabulous idea and sure feels like a great addition to one of the best events of the summer. The Taste of Red Deer – summer edition, is teaming up with CentreFest on Friday, July 26. Here’s the news straight from CentreFest and the Red Deer Regional Health Foundation (Taste of Red Deer). Summer Just Got More Delicious! 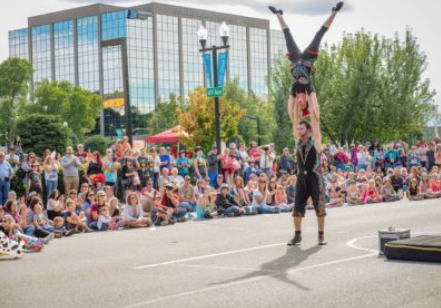 CentreFest, Central Alberta’s largest street performer festival, is pleased to announce a partnership with the Red Deer Regional Health Foundation’s Taste of Red Deer. On Friday, July 26 from 6 to 9 pm, Taste of Red Deer will join with CentreFest to bring delicious food tastings to the already popular event. The partnership between the two organizations seemed a natural fit, both set on bringing young and old alike to Red Deer’s downtown core for unique entertainment, delicious food, and family fun! Taste of Red Deer will draw between 25 and 30 local Central Alberta restaurants, each sampling some of their best menu items. Guests will purchase food vouchers to spend on whatever tantalizes their taste buds. Proceeds from the Taste of Red Deer event will go directly to purchasing equipment for the Red Deer Regional Hospital Centre. A full slate of CentreFest performers will be on hand Friday night to provide unique & fun-filled entertainment while guests sample an array of food items from local vendors. CentreFest and Taste of Red Deer is a family-friendly event and is free of charge to enter, with food tickets required for menu samplings. Tim Tamashiro with some advice for young people.. 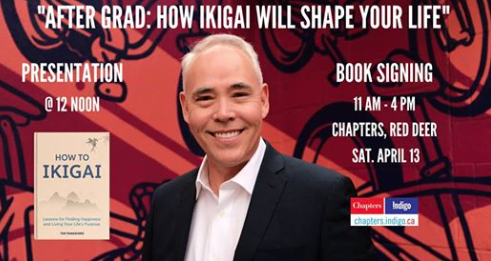 Author, RDC alumni and former CBC Radio host Tim Tamashiro will be at Chapters Red Deer on Saturday, April 13th. He will deliver a presentation titled “After Grad: How Ikigai Will Shape Your Life”. Tim will share insights on the meaningful work of life’s purpose from his bestselling book How To Ikigai. Graduation is a time for celebration. But what truths do grads face after grad? Does life only consist of a series of jobs in order to make a living? Tim believes that there’s a difference between your “job” and your “work”. Your “job” provides you with an income, safety, security and maybe even a boost to your ego. You “work” can result in something bigger and more rewarding. Your work can result in your Ikigai or your “life’s worth”. Join Tim for a special presentation at Chapters Red Deer. He will be available from 11 am – 4 pm to sign books. He will deliver his presentation at 12 noon.